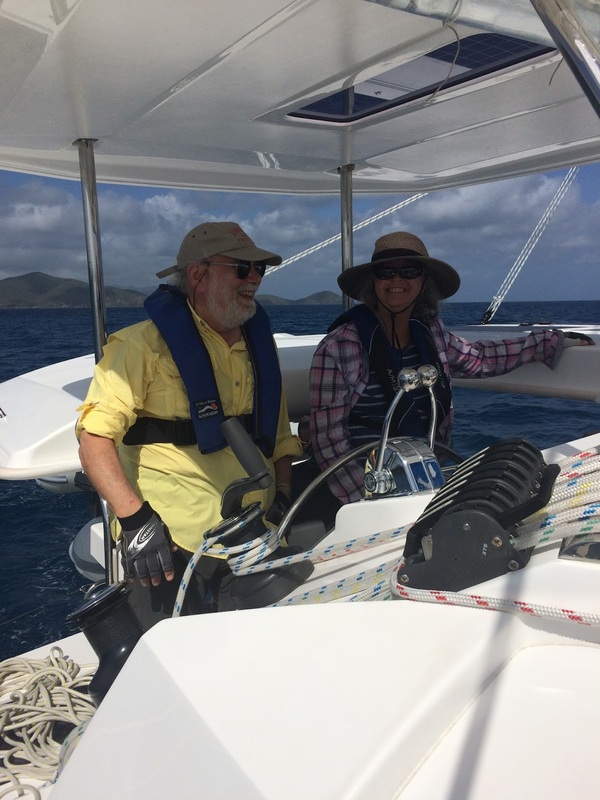 Having just returned from our second bareboat sailing trip in the British Virgin Islands, I find myself struggling to find the right answer to the question "how was your trip?" 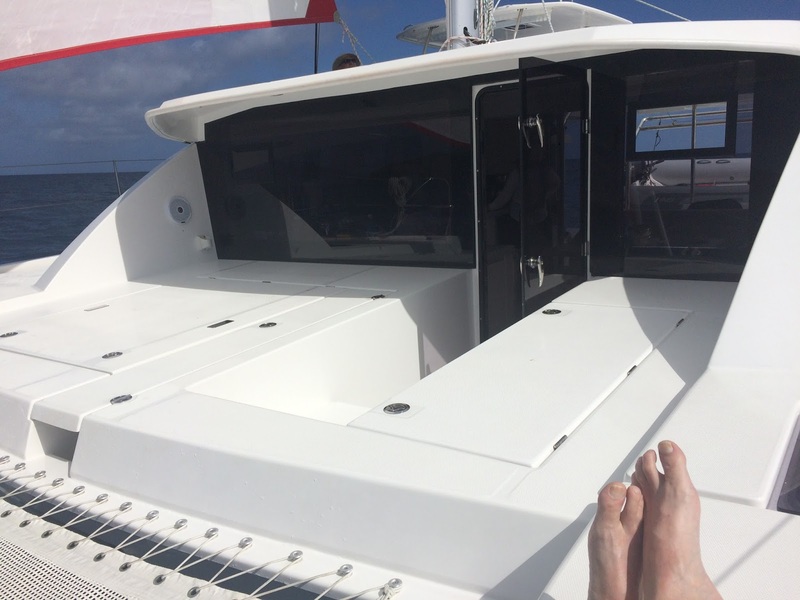 Sailing in the middle of the Caribbean for a week on someone else's million dollar boat is a pretty magical thing. 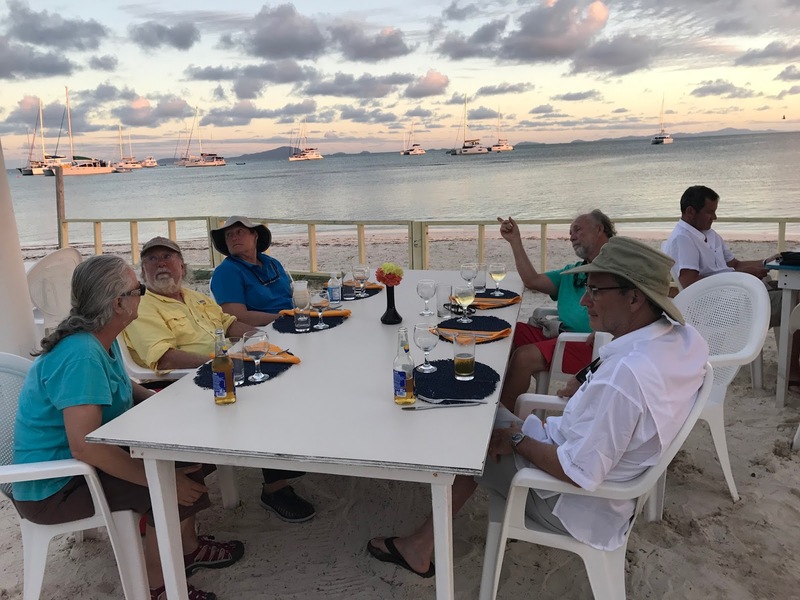 There are so many parts of the experience to appreciate, whether it is the boat itself, the clear blue water, the sounds of the sails in the wind, the beauty of the islands, the sandy beaches and colorful coral, or just the water splashing against the boat. So when you go on a trip like that, it can be hard to critique. I'm pretty sure any complaints I might come up with in response to "how was your trip" would just come out sounding lame and ungrateful. Which I'm also pretty sure they would be. 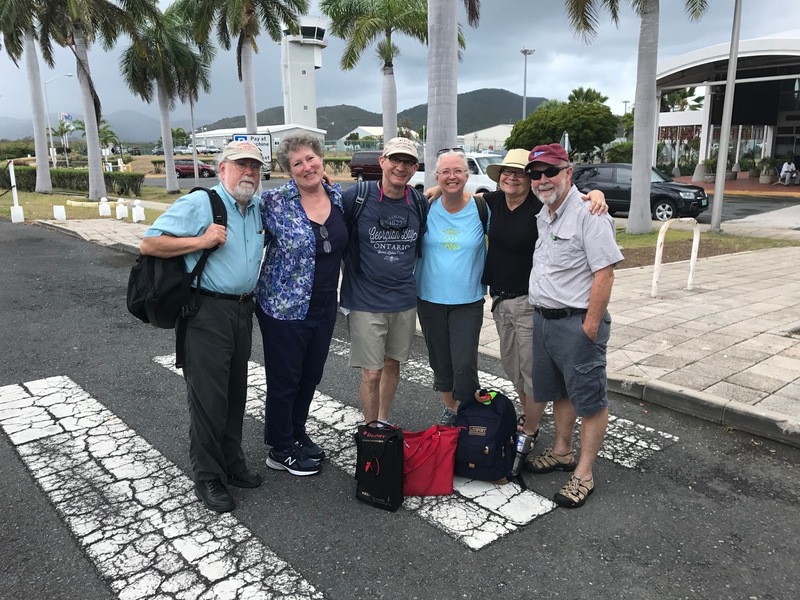 The crew arriving by plane in Tortola from San Juan. 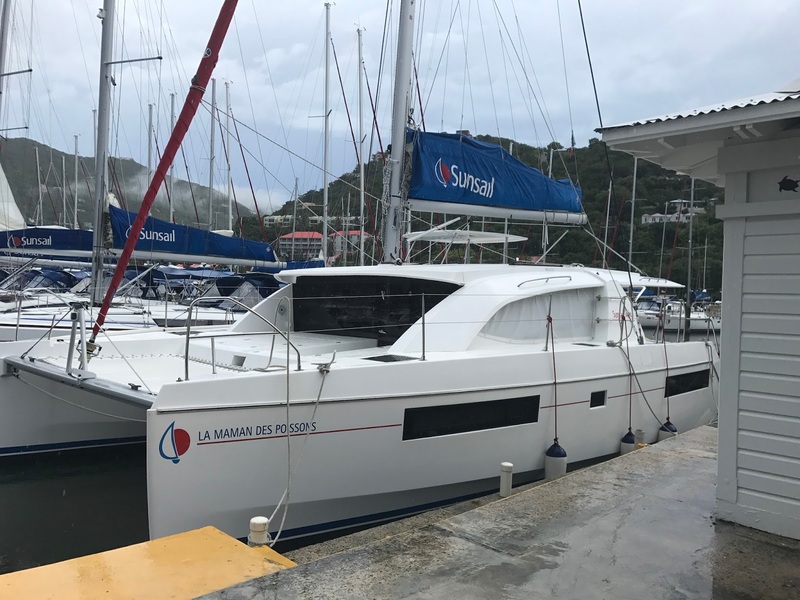 Our first glimpse of our 40' boat docked in Tortola. Always more view to see. With that said, there are some things I look for when assessing a trip's success or failure. For example, I consider it a good trip if I learned or saw or did something new. So using that criteria, the answer to the question would be yes, it was a good trip. 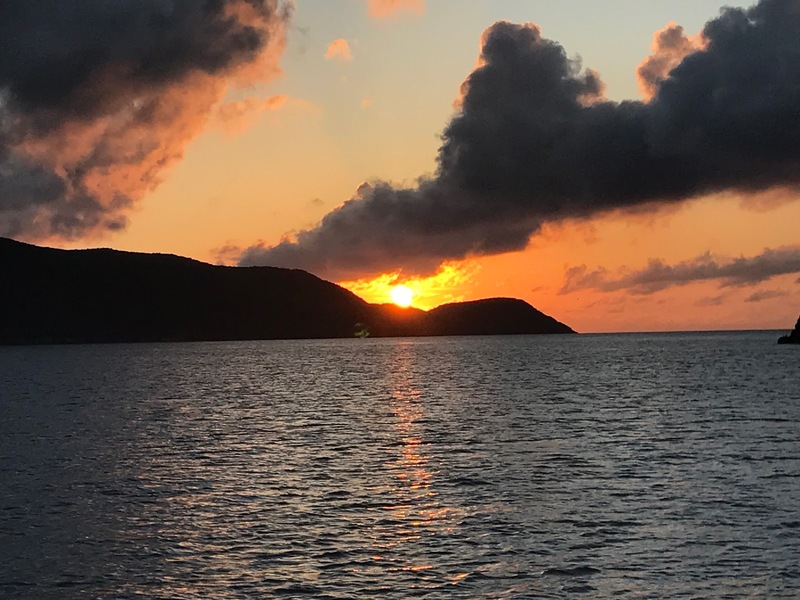 Some of what we learned was based on last year's trip, such as knowing that we needed to purchase all of our food before leaving the dock that first day, since there would not be any real grocery stores after we left the home base in Tortola. Another learning from last year was how to use mooring balls instead of anchors when docking over night. Mooring is often used as a way to protect the fragile coral in the area from being damaged by heavy anchors. This year, in areas where it was allowed, we added the skill of anchoring at night. 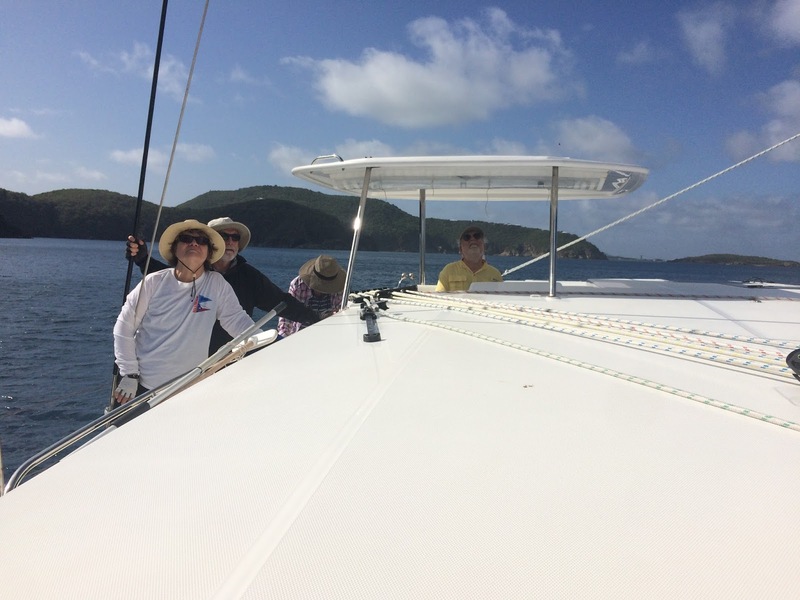 While we always anchor our 33' boat when sailing in Rockport, when you are anchoring a boat that is 40' long and 20' wide, it can be a bit more nerve wracking. The first night we docked that way, Stan woke up about every two hours just to make sure things were in the same place as before. I think I woke up about every three hours to do the same thing. Dinghy docks on an island where we stopped for dinner. 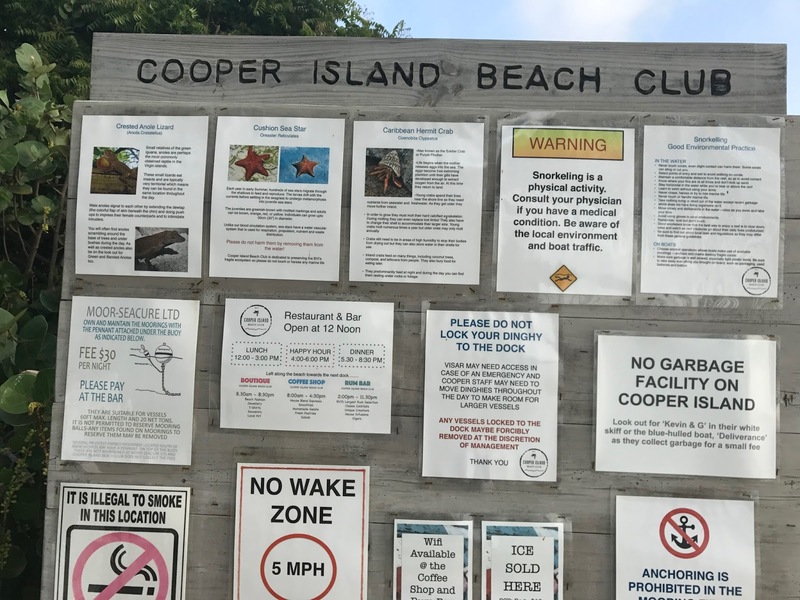 Local happenings at one of the island's. We also learned from last year's trip that it is helpful to identify potential roles and tasks for everyone prior to the trip. 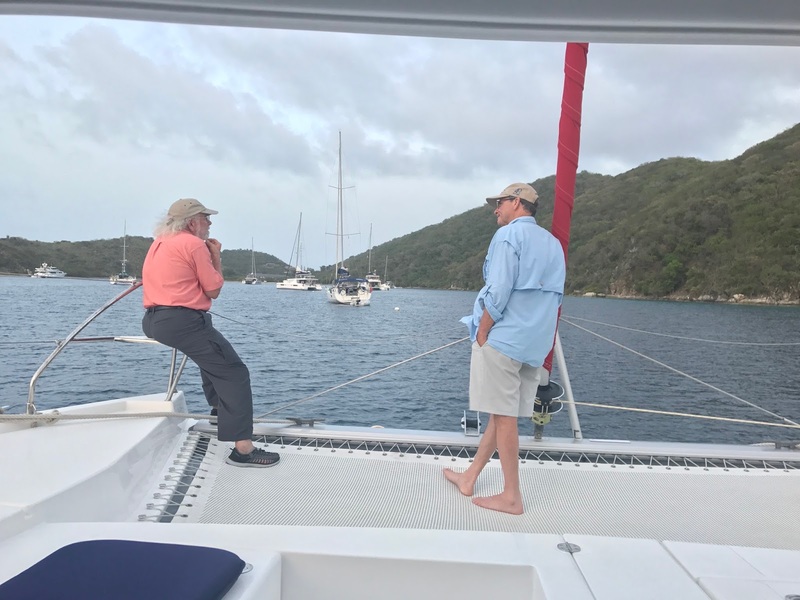 While the roles of Captain and First Mate are pretty obvious ones, we also needed a crew member to handle the petty cash so that when someone motored up next to our boat asking for mooring money or trash to unload, we would have the funds handy. Another role was that of Dinghy Captain, for getting us safely on and off the boat to go snorkeling or exploring nearby islands. 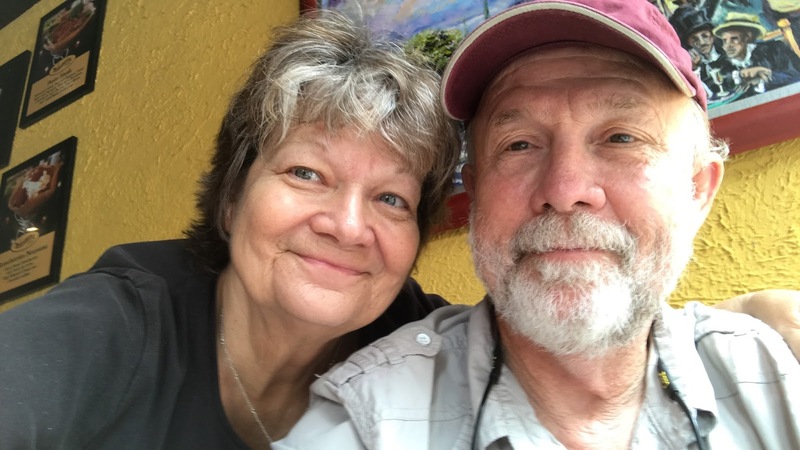 I tended to be a floater, always checking to see where help might be needed, or thinking of details we might need to be aware of. I suspect the rest of the crew was just happy to keep me away from the helm - you know the saying "jack of all trades, master of none." 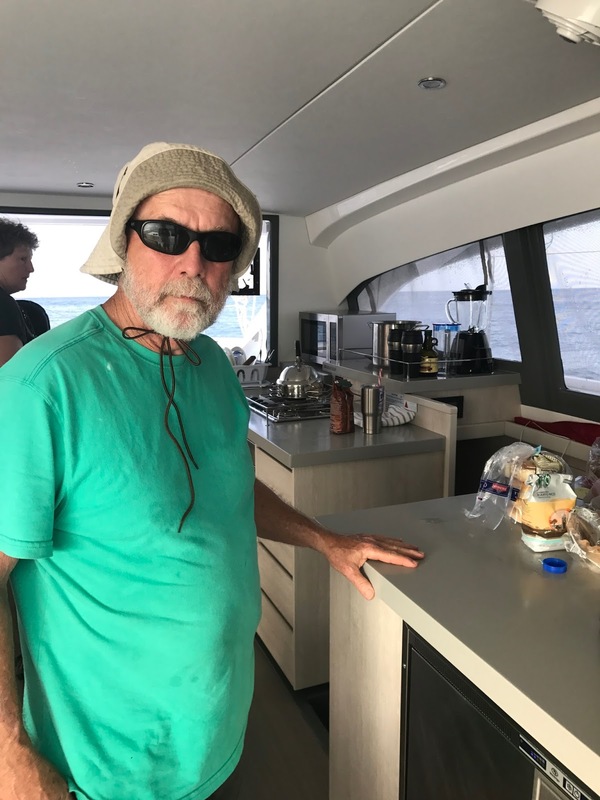 Another crew member took on the bulk of the cooking, and another was always at the helm with the captain and first mate helping pull in lines or make adjustments to the sail. Our dinghy captain - with our boat in the background. Then there was the invaluable crew mate who took on the job of taking the boat hook to the top of the boat to help guide the sail away from the "lazy jacks" which was supposed to easily fold the sail up when you brought it down. But the lines were always getting in the way of getting the sail up. All were critical jobs, but that particular one took the most agile among us who was comfortable standing on an unstable, moving boat next to a very large sail that could easily knock him off his feet and into the water below. Thankfully, there were no mishaps. Another day at the office - or rather, at the helm. A little relaxation at the end of the day. And there were some items we all learned together, such as studying the charts at night in order to plan our route for the next day, even though the weather could often change those plans. Another difference this year was that we didn't sail with a flotilla of other boats like last year. This year we were totally on our own and free to make our own mistakes without anyone else to blame. It seems we were up to the challenge - and luckily we were a very forgiving group. That's not to suggest that everything was perfect. We all came aboard with our own little quirks. Sometimes our individual needs were not always in sync with one another and sometimes our different communication styles would result in misunderstandings or confusion. But those are things that happen anytime you get two or more people together - they just get amplified when you are living in close quarters. And in my book, those differences can be a good thing, especially if we are open to learning from them. And some of our quirks were pretty darn endearing. One of our crew was fond of making up funny stories about what she thought was occurring on nearby boats - usually as she watched with binoculars. But in doing so, her British accent (which came naturally to her, since she was, after all British) always ended up sounding a bit like a pirate telling us the story. 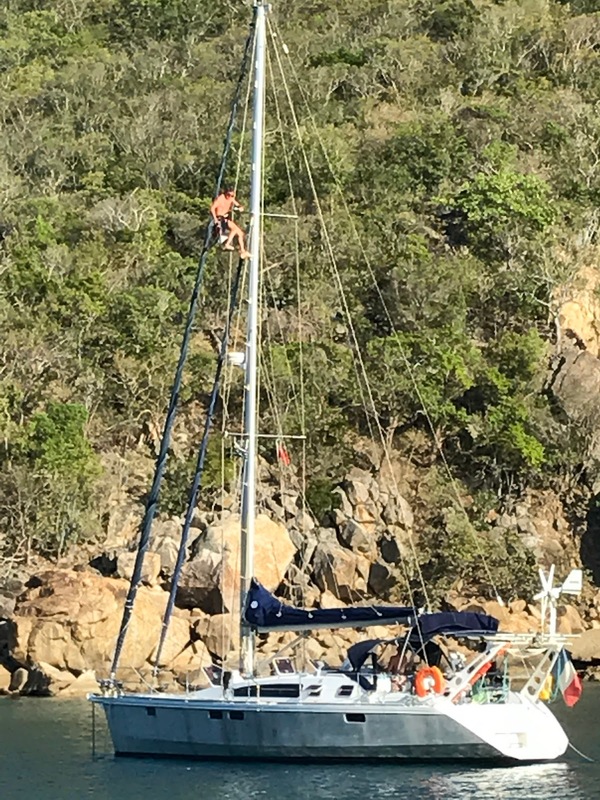 was way better than the real reason this guy was up on his mast. And another crew member (who happens to also be my husband) has this quirk of having to have every line on the boat be wound up perfectly. I sometimes would entertain myself by showing him my tangled earphones and phone cords - just to see his horrified look. Well, and possibly also because I knew he would not be able to stop himself from untangling them. But besides learning things, we also saw things we had not seen before. One night we were anchored in secluded Lee Bay, with only one or two other boats within our sight line. 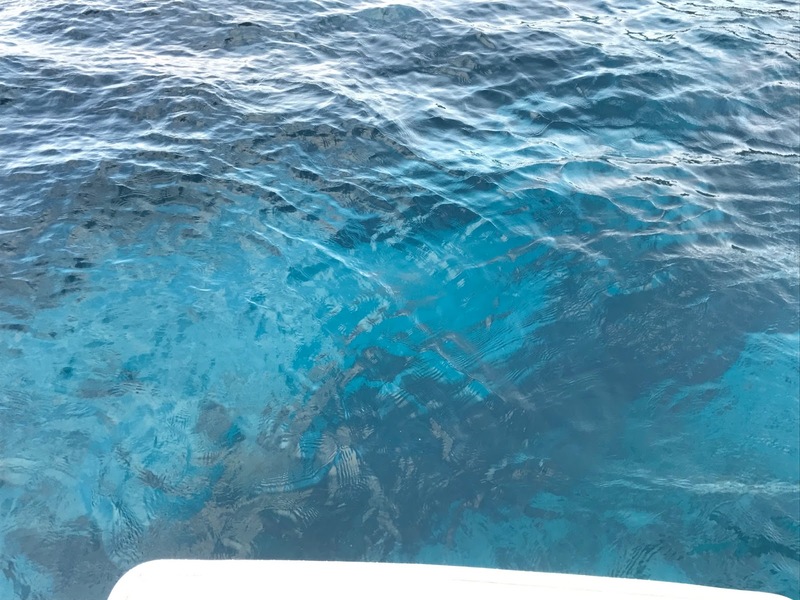 We had finished dinner and had just concluded our chart meeting and turned off the lights of the cockpit when we noticed a line of four or five feet long tarpon swimming in front of the bow of the boat. As we all grabbed flashlights to get a closer look, we saw something even more exciting. As we looked out on the water, we could see flashes of light erupting, sometimes briefly, sometimes in groups, and sometimes like an explosion of light moving from the water up through the air before bursting like fireworks. We were mesmerized watching these phosphorescent fish popping up all around us, something none of us had expected to see. I think that's really at the core of a good trip. 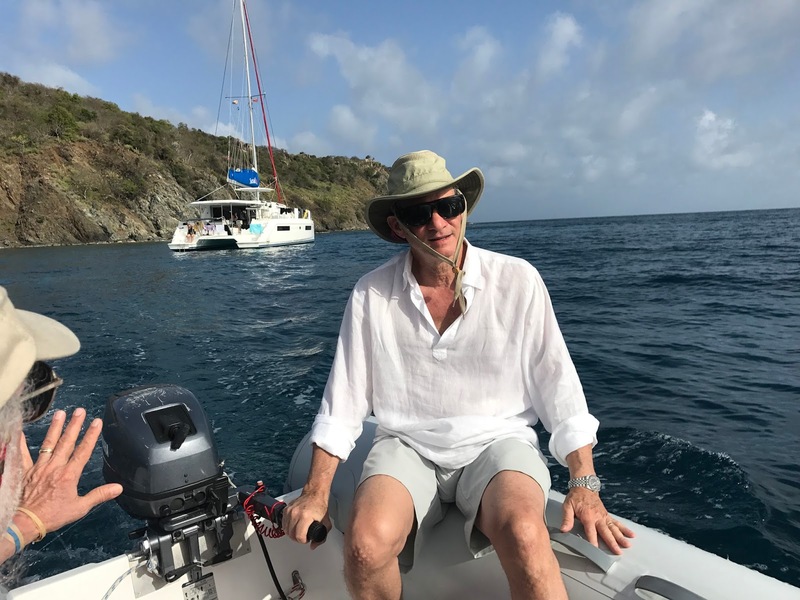 It doesn't matter if it is sailing in the British Virgin Islands or taking a car trip through the deep south. Traveling gives us a chance to get out of our normal routines, to get unstuck from our habitual ways of doing things, and to learn things not only about things we are seeing, but also about ourselves. Ready for anything - especially large gusts of wind. I learned on this trip that I'm not as much of an adventurer as some of the other crew were. I wasn't interested in having long sailing days and trying challenging sailing maneuvers. I was really more interested in taking in the beauty that surrounded us, of appreciating the simplicity of being on a boat with a limited set of distractions or things needing my attention, and of re-learning how to simply be in the moment with the sights and sounds of nature all around me, while being pushed by the wind toward a new day. One of our mooring spots. 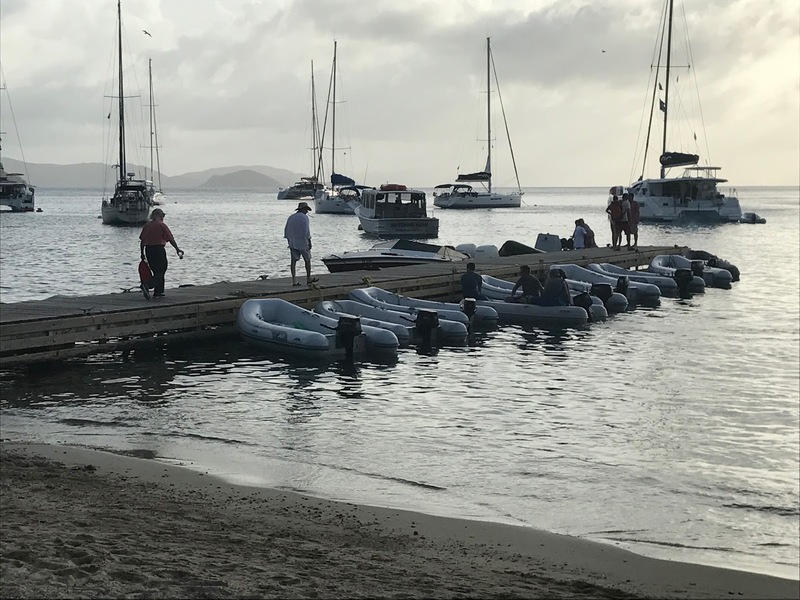 Last year after our BVI trip, I suggested that choosing your crew, matching activities with the location, remaining flexible, bringing a sense of humor, and honoring your fear, were important on a trip like this. This year, I would add that it's also important to remember to just let yourself be fully present and enjoy the moment. So, I guess I do know the answer to the question "was it a good trip?" after all. Sailing is fun, but it is always good to be headed home.